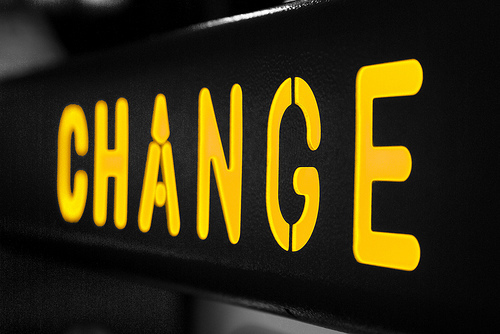 Change – love it or hate it? I have a love hate relationship with change! Personally, i enjoy change but it can be so daunting sometimes. On a side note, what the hell was Katie Holmes wearing on Rachael Ray’s show? No offence, but isn’t she a tad too young to be wearing that grandma outfit? I can’t find a picture of her from the show so i can’t post it up. She is cute but she doesn’t dress the part. Oh well! By the way try typing in grandma smok on google search and the first suggested search string that comes up is grandma smoking weed. The pictures aren’t that funny though. Now on to the topic of change. For those of you who know me you will know that i have recently graduated and have been looking for work. Firstly the change from student life to working life is scary as hell! Yes i have done internships but that seemed so easy (come to think of it, looking for internships wasn’t ever easy). But you get my point, and since the economy has gone to the pooper the transition is even more daunting for most of us. Since, i am having such a hard time with it, I can only imagine what other recent graduates must be going through. Therefore, over the next couple of days i will be going through things like how to write your resume or rather how to sell it and also cover letters and a streamlined application process. I am not making any money out of it and those are just things that i am learning myself too and I would like to share them with others. Furthermore, I am also contemplating whether or not i should go to grad school next year. So far the only masters that seems in line with my career objectives is an MBA and you need some work experience for that. I might enroll myself in some modules just to get a feel of things though. Are any of you looking into grad school? If yes what is it that you look for in a school. Let me know because i am really confused right now! In other news, i have dropped 5 kgs in the last one month and some of my friends have asked me for a diet plan but the thing is there really isn’t a diet plan just a healthy diet and a little bit of exercise! and by little i mean very little like 15 minutes a day but anyways i will still be coming up with a plan! And no i have not given up on chocolates! I have been working on NaNoWrimo as well and i have finally hit 15000 words! i hope to reach at least 18000 tonight if not more. What i have decided to do is to write down whatever comes to my mind and then organize it later. It seems to be working so far. What about you guys? Let me know about your progress! Do you like changing? How did you make the transition between student and work life? Did you guys pin on your poppies for Remembrance day? Share your pictures! True! how are you handling it so far? I just moved from one continent to another and it’s just too much to take. I miss my friends, boyfriend and pretty much everyone i care about. I have changed 10 schools since i was little and people believe that change should be like second nature to me now but it really isn’t! No matter how wonderful things can get later, the whole process is everything but eudemonic. Transition is hard but it does get better! I hope you find the right job that fits for you 🙂 15,000 words is awesome! I’m still stuck at 4500.. Thank you! and i think 4500 words is alright, you can get somewhere as long as you have started! Good luck!